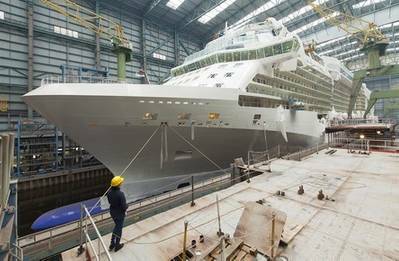 On early Sunday morning of 12 August, 2012, the Celebrity Reflection, the new cruise ship for the US cruise company Celebrity Cruises (Miami), is planned to be floated out of the covered building dock II of Meyer Werft, assisted by tugs. The 126,000-gt cruise ship Celebrity [Reflection] is 319 m long and 37.40 m wide. In 1,515 cabins more than 3,030 passengers can be accommodated. She can reach a speed of 23 knots, and is the only ship among her four sisters that has 16 decks rather than 15, which increases the number of cabins by another 72, and provides more space in the theatre and in the restaurants. With the ship being berthed at the yard's pier, the remaining interior finishing work as well as tests and trials will be carried out in the next few weeks. Once the float-out is completed, the first crew members will move into their quarters on board. The shipbuilders warn that the time schedule for the float-out may change at short notice due to weather conditions!